More and more crude oil is being transported into California by rail lines, and questions about safety are prompting local governments and environmentalists to take action. Environmental groups filed suit yesterday against the Bay Area Air Quality Management District and energy company Kinder Morgan. A KPIX investigation found Kinder Morgan has been unloading trains full of crude in Richmond. Earlier this week, the Richmond and Berkeley city councils both passed resolutions opposing crude-by-rail projects. Richmond's was against the Kinder Morgan operations; Berkeley's against a Phillips 66 plan to build a rail terminal at its San Luis Obispo County refinery. Here's a quick review of what's going on with crude-by-rail in the Bay Area, and why. Oil companies want to transport crude oil by train because it's cheap and (relatively) local. Bay Area refineries mostly get their oil from pipelines and ships, from Southern California, Alaska and the Middle East. But there's an oil boom right now in the middle part of North America. In North Dakota it's oil coming from the Bakken formation, and in Alberta it's from the tar sands. Oil companies want to get all that oil to the coasts, where the refineries and most of their customers are. In defense of the projects, oil companies point out that this oil is either from right here in the U.S. or from our friendly neighbor Canada, rather than from overseas. Crude oil imports by rail into California have shot up in recent years, from zero in early 2009, to more than a million barrels in December 2013. 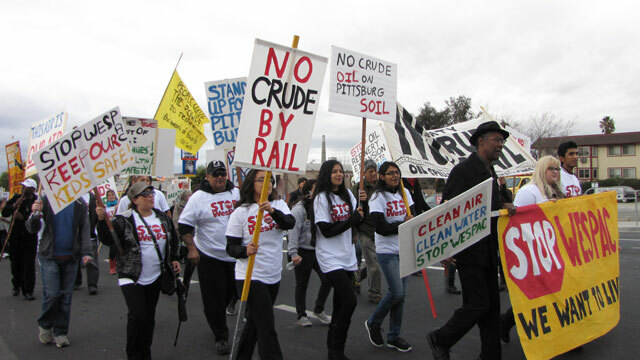 Opponents of crude-by-rail are concerned about public safety and environmental impacts. Crude oil from Alberta's tar sands is heavy and high in sulfur. Environmentalists say it’s “dirty,” that it pollutes more to get it out of the ground and to refine it. So that’s the climate change and air pollution side. On the other hand, the safety concerns are mostly about the oil from the Bakken formation. It's light and sweet, that is, lower in sulfur. But it’s also volatile. The oil trains that have derailed and exploded recently, including the one in Lac-Mégantic, Quebec, that killed 47 people, were carrying Bakken crude. It turns out crude-by-rail was already coming into Richmond. 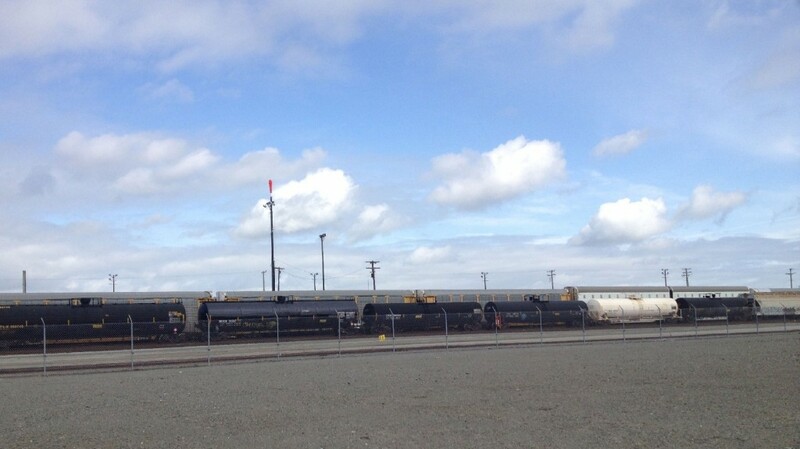 Kinder Morgan has been bringing in 100-car trains of crude oil to its terminal in Richmond, which is on the BNSF rail line. KPIX followed the oil as it was loaded into a truck and brought to the Tesoro refinery in Martinez. There are more crude-by-rail projects on the table in the Bay Area and Central Coast. Valero wants to build a crude-by-rail terminal at its refinery in Benicia. The city is working on an environmental impact report on the project. In Pittsburg, an energy company called WesPac is trying to open an oil terminal that would bring crude in by rail, pipeline and ship. The city recently reopened that environmental impact report, to do more research on the project. And on the Central Coast, the Phillips 66 refinery in San Luis Obispo County has applied to build a rail terminal. The comment period on that project has also just been reopened. There has been some progress on making transporting crude oil by train safer. The National Transportation Safety Board has been asking for safety upgrades to the tank cars used to transport oil. Those would need to go through the U.S. Department of Transportation; the NTSB can make recommendations, but not regulations. That’s been a slow process. Meanwhile, the Association of American Railroads has announced voluntary safety improvements for crude-by-rail, including more inspections on rail lines, decreased speeds in urban areas and updated brake systems.